Dermot McElroy made it into the winner’s circle at RosapennaBallymena’s Dermot McElroy set a new course record en route to a four-stroke victory in the 36-hole Rosapenna Senior Scratch Cup. 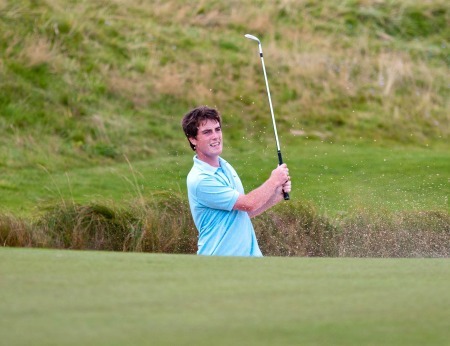 The Irish international, 19, fired a three under par 69 to set a new best for the Sandy Hills Links in his morning round before adding a level par 71 on the Old Tom Morris Links in the afternoon to win on three under 140 from Rathmore’s Ben Best, who shots rounds of 70 and 74. Dermot McElroy in action at RosapennaBritish Amateur champion Alan Dunbar opened with a one over 73 but dropped four shots in a three hole stretch from the 12th on the Old Tom Morris Links in the afternoon to finish well out of the frame. McElroy headed the field by a shot from plus one handicapper Best after carding six birdies and and three bogeys in his course record 69 with Simon Ward carding a 71 and the quintet of Dunbar, Connor Doran, Rory Leonard, Francis McGinn and Forrest Little’s Caolan Kennedy all signing for 73s. After 27 holes, Dunbar was still in the mix on one over after going out in two under par. But the Rathmore star bogeyed the 12th and 13th and then double bogeyed the par-three 14th to see his challenge evaporate. McElroy covered his front nine of the afternoon round over the Old Tom Morris Links in two over 37 and dropped another shot on the par-four 10th to fall back to level par overall. Sponsor Noel McGinley presents the trophy to Dermot McElroyBut he finished like a champion, notching a crucial par at the long and difficult 11th before reeling off three birdies in a row on the 12th, 13th and 14th to get back to level for his round and three under for the tournament. He then cruised home, finishing with four solid pars to post a three under par total of 140 that left him four clear of runner-up Best with Galway’s Eddie McCormack in third place on two over 145. Mourne’s Reeve Whitson finished fourth on five over 148 with Ardee’s Evan Farrell in fifth. McElroy thanked the sponsor Noel McGinley of McGinley Motors of Letterkenny for his backing of an event which boasts a high quality list of winners. including world No 1 Rory McIlroy in 2005. 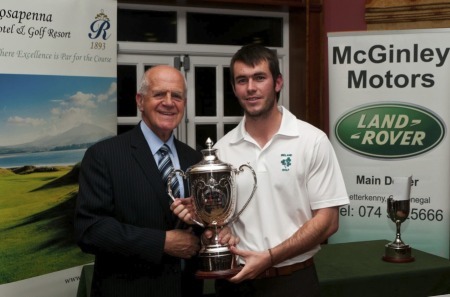 Aaron Kearney won the 2011 Rosapenna Scratch CupIrish internationals Reeve Whitson and Dermot McElroy are the favourites to lift the 36-hole Rosapenna Senior Scratch Cup at the Rosapenna Golf Resort in Co Donegal this Saturday. Alan Dunbar will be one of the favourites to lift the Rosapenna Senior Scratch CupAlan Dunbar will tee it up in the Rosapenna Senior Scratch Cup this weekend after turning down the chance to play in the KLM Open. Rory McIlroy in action in the 2007 Rosapenna Senior Scratch Cup. He won the inaugural edition in 2005. The Rosapenna Senior Scratch Cup has moved to the beginning of the amateur calendar with the 10th staging taking place from April 5-6 next year. Galway Golf Club's Eddie McCormack claimed the 10th edition of the McGinley Motors sponsors Rosapenna Senior Scratch Cup after the third round was abandoned due to high winds at the spectacular Donegal resort.